This past Friday morning, my husband and I headed to Bastrop for the ZOOMA Texas race. I was tired, but excited for the day ahead. 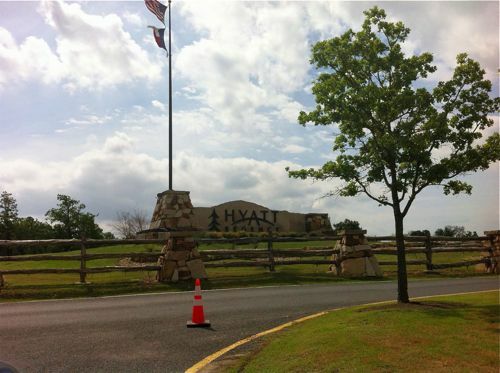 After a couple of stops along the way, we made it to the Hyatt Regency Lost Pines Resort. As we drove into the resort, I got my first glimpse of part of the race course that we would be running the next day. To say these hills weren’t intimidating would be lying. I thought I’d been running some tough hills back home. Yeah, those were nothing compared to these. We parked and headed to the lobby to check in. The line was long, but moved quickly. 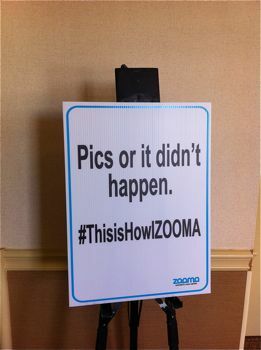 I loved seeing all of the ZOOMA signs around the hotel! 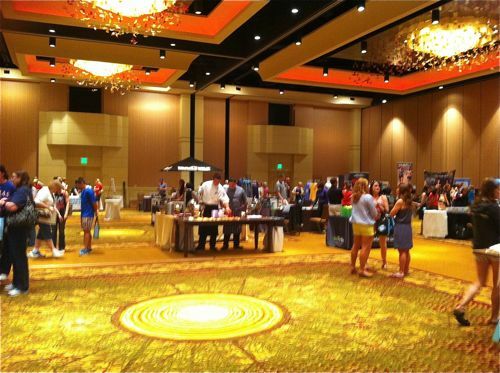 After stopping by the room to drop off our luggage, I headed down to the race expo to pick up my race packet. I then headed back to our room to hang out before getting ready for the Mocktail Party. My husband went to the gift shop to grab us a couple of cups of coffee. I was exhausted at this point and needed some caffeine badly. Looking back, I probably would have been better off trying to lay down to rest for a while. Live and learn. At around seven o’clock, I walked to the patio where they were hosting the Mocktail Party. 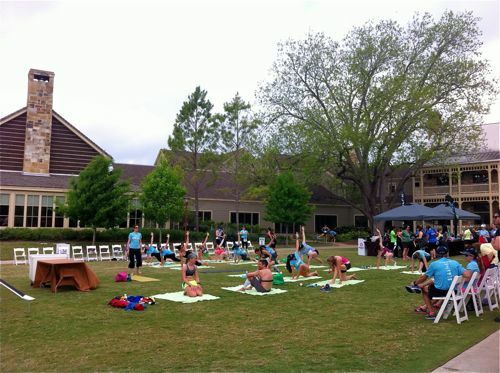 There were mocktails from the Honest Tea company, some snack foods and glasses of Barefoot Wine being served. I opted for one of the mocktails, which was pretty tasty and refreshing. It was so great to finally meet and chat with all of the other race ambassadors! Sarah, Landi,Me, Megan, Farrah, Lora, Amy. I had also met and chatted with Jennifer, who left the party prior to this pic. Shortly before eight o’clock we went our separate ways, and I headed back to our room to find out out what our dinner plans would be. I hadn’t eaten anything since lunch, and I was starving at this point! 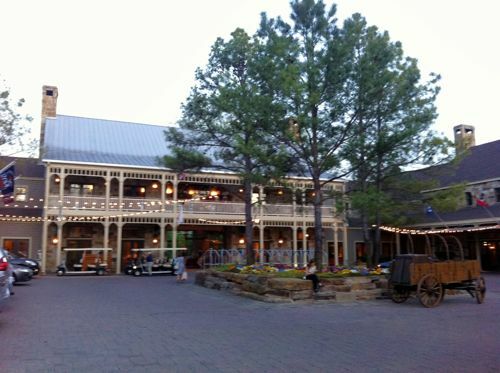 We debated over whether to have dinner at the Firewheel Cafe located in the hotel, but upon seeing the line of people waiting, we decided to head out of the resort to see what we could find. Again, this is one of those things that I would do differently if I could do it over again. We relaxed and watched a little TV before settling down to go to sleep around midnight. After tossing and turning a little bit, I managed to fall asleep. Unfortunately, I wasn’t able to stay asleep. I was wide awake at 2:30 AM. My mind was filled with thoughts about the race and would not shut off. 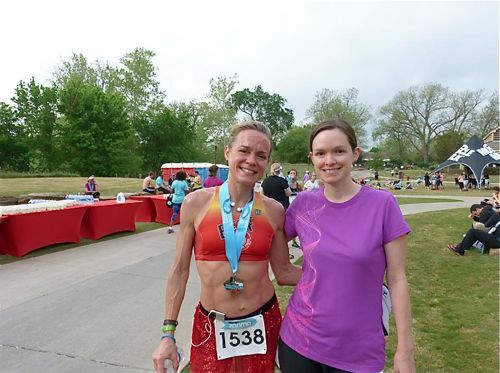 I wasn’t feeling really strong coming into this race, and being exhausted and thinking of running a very hilly half-marathon in just a few hours was really starting to freak me out. Now, I’ve run all of my races on just a few hours of sleep. This wasn’t me just feeling sleepy, I had never felt this exhausted before any of the races I’ve done. I went back and forth in my head about whether to pull out of the race or try to run it anyway. I wondered what my friends and family would think. What would the other ambassadors think of me backing out? When I still hadn’t slept by the time 6:30 rolled around, I just knew that there was no way I would make it the whole 13.1 miles. I thought about trying to see if I could downgrade to the 10k, but knowing how crazy race mornings can be, I didn’t want to bother the race coordinators with it. Some tears may or not have been shed over my decision to back out that morning. I hung out in the hotel room until around 9 AM, then headed out to the finish line to watch some of the runners come in. Honestly, I really just felt like hiding out in our room until it was time to check out. I was very embarrassed and really didn’t want to have to face the other ambassadors knowing that I would probably have to explain that I hadn’t run that morning. The first person I ran into was Jennifer, who was the second female runner across the finish line that morning! She was super nice and comforting when I explained that I hadn’t run. Her mom is also one sweet lady and snapped this pic of us! I hung around the finish line watching the other runners come in. Not going to lie, it was tough to see the finish line, hear the music and watch all of the finishers getting their medals. Although, the race weekend didn’t go quite like I had planned, I still had an awesome time. ZOOMA puts on an amazing race weekend. They don’t just put on a simple race, they create a whole wonderful race weekend experience! If one of these races isn’t on your bucket list already, then put it on there now. 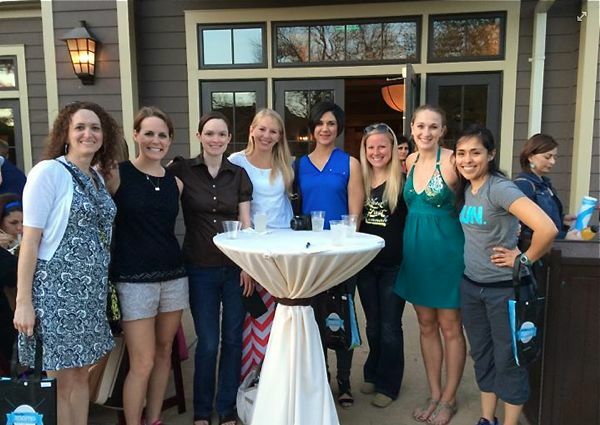 Although, I don’t have a real race recap of my own, some of my fellow ambassadors have some great ones! Before I go, I want to thank ZOOMA for the opportunity to be an ambassador. It was a wonderful experience! Have you ever done a ZOOMA race? By Tempie at April 18, 2014 . Tempie, I had no idea. I’m so sorry you were feeling that way. I think you are an amazing person, that was such a tough decision to make. But you know yourself and you know what’s best. I know you will redeem yourself and rock that race next year! We will be there with you! Maybe you can run it next year. Must have been hard not to run, but fun to meet the other bloggers! 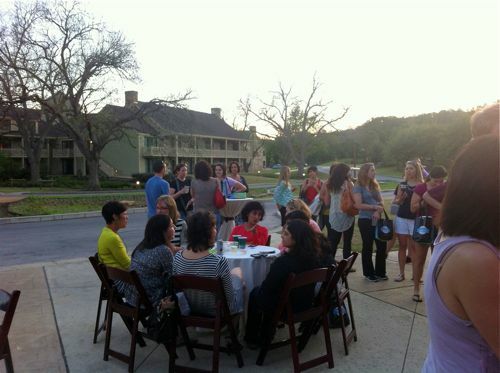 It really was great to finally meet all of the bloggers in person! I think you did the right thing by listening to your body!! There is no reason to feel embarrassed, I think most runners have been in those shoes and had to make a decision like that (myself included!!). It’s always tough to do it, but only YOU know what’s best for you. Like Farrah said, you’ll be back next year and ROCK it… I know it! 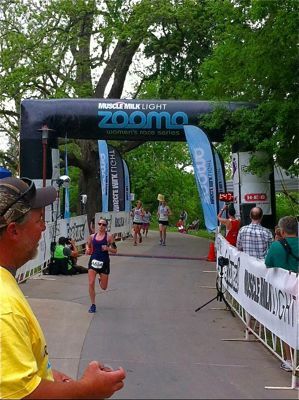 I really enjoyed getting to see some of you awesome ladies come across that finish line, too! I’m sure it’s all experience that will help you in future races. I hope you have an easier time next race.